Adhesive-free compact thermoplastic holder that keeps your pick close at hand! Great for musicians who combine various finger-style / plectrum techniques on bass or guitar. 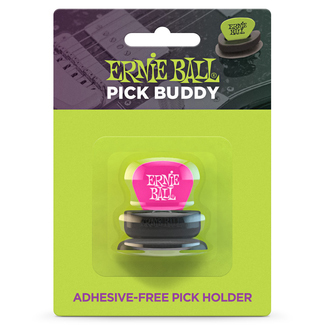 Using Ernie Ball's innovative self-adhesive suction technology simply press Pick Buddy onto your pickguard or nearly any surface of your guitar for instant access to your pick. - Never lose your pick again! always prompt service and an accompanying note from John!